Solidarity, persistence and the support of the IUF have won reinstatement and permanent positions for 23 workers unfairly dismissed at Unilever’s factory in Rahim Yar Khan, Pakistan for supporting the fight for permanent employment contracts. The 2007 struggle at Rahim Yar Khan was one of three conflicts (two in Pakistan, one in India) with Unilever which were ultimately resolved in 2009-2010 through direct negotiations with the company under the auspices of the UK’s National Contact Point for the OECD Guidelines for Multinational Enterprises. As a result of that process, Unilever agreed to recognize the IUF and enter into a formal engagement process. It was within the framework of that engagement that the IUF insisted on the need to fully address all issues at Rahim Yar Khan involving implementation of the 2009 agreement and obstacles posed by local management obstructions. Reinstatement of the 23, all of whom had been employed at the factory for more than 9 months and therefore should have been offered permanent contracts but were instead dismissed, was crucial to resolving these issues. All 23 are now back at work on permanent contracts, including two workers who were working in Dubai and Saudi Arabia but maintained regular contact with the IUF and have now returned. Unilever creates separate spreads division for Europe, North America – what will it bring workers? The future of spreads at Unilever has provided endless speculation for the financial press and considerable concern for workers in this part of the company. Unilever’s announcement in an investor conference on December 4 that it would be creating a stand-alone spreads division will generate more speculation and more concern on the part of workers potentially affected by a future sale of the division, particularly as it represents a relatively well unionized part of Unilever’s operations in the two regions. The new division, to be called Baking, Cooking & Spreading Co., will not – for now – include spreadable Hellmann’s mayonnaise or Marmite, will only apply to the business in Europe and North America, is planned to be operational by mid-2015 and will remain 100% Unilever-owned. But sluggish sales and the growing North American preference for butter over margarine inevitably call into question the future of Unilever spreads. Chief Financial Officer Marc Huët, who has been repeating to investors the need for Unilever “to reduce dependence on foods”, told investors that “spreads are an important part of our heritage, but this will never be a barrier to us taking decisive action.” While it remains true that, as a company spokesperson was quoted saying in a press report on the spreads announcement, “the cash delivery [from spreads] is important to us”, the division is digestible enough (valued between EUR 5.5 and 8 billion) for a private-equity fund to snap it up in a debt-financed buyout now that leveraged buyouts are again growing in size. Food and refreshments (beverages and ice cream) last year accounted for some 49% of Unilever revenue (see the IUF report on Selloffs and cash cows). Eliminating spreads would reduce turnover by some 7%. But food – even with spreads – and refreshments last year continued to deliver a higher percentage of profit than the non-food divisions, making them an essential cash engine for acquisitions. A stand-alone spreads division with its own financial accounting would presumably enable a more precise analysis of the profit sources within Unilever, generating new benchmarks and new pressure on workers, who already face very tough bargaining in spreads. Above all, this latest development, following as it does the string of recent divestments, highlights the need for unions at Unilever to secure succession clauses ensuring that terms, conditions and trade union rights are carried over in any sale. 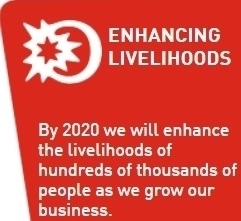 Unilever’s Sustainable Living Plan includes sustainable divestments but has no commitment to sustainable employment. 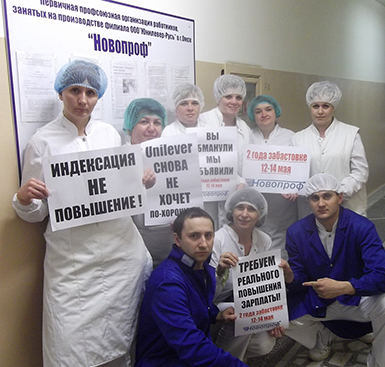 Unilever management at Russia’s biggest ice cream factory in Omsk, Russia has again driven the collective bargaining process into deadlock despite the patience and good will shown by IUF Novoprof members. Earlier this year, the union suspended its campaign for the first-ever wage negotiations at the factory when the company agreed to talks. The demands put forward by the workers and their union are simple; annual wage indexation in accordance with inflation (obligatory under Russian labour law) and annual negotiations on an additional wage increase. These demands are not new. Two years ago, hundreds of ice cream packers (all of them women, all of them former Unilever employees outsourced to an agency supplying exclusively to Unilever) struck for three days demanding a return to direct employment, recognition of their union and decent pay and conditions, including a real wage increase. Their slogan at the time was “A grand per shift”, i.e. 1000 roubles or 30 USD per 12-hour work day. The strike resulted the in the establishment of the NOVOPROF union and the return to direct employment of its members, but wages remain USD 23 per shift, far below the regional industrial standard. Local union leader Lilia Nasreddinova condemns Unilever for “playing games with us”, adding: “They pretend to be socially responsible and willing to talk with us, but they repeatedly refuse our core demands. We are not going to tolerate this any longer”. 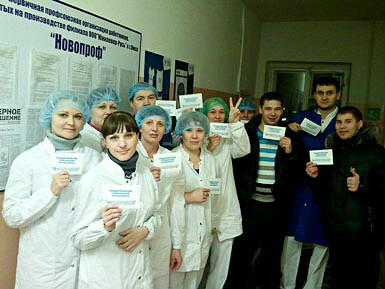 NOVOPROF and its local in Omsk have called on members to be ready for industrial action. NOVOPROF Omsk local union committee members at the factory with placards reading “Indexation is not the same as a wage increase”, “We demand a real wage increase” and “You cheated, we called for action”. Over the past two years Unilever has been accelerating the selloff of food brands and manufacturing facilities. From 2000-2010 this was called the “Path to Growth” and “One Unilever”, a process which shrunk the company’s brands from 1,600 to less than 400 and reduced the number of global employees by half. CEO Paul Polman now calls this “pulling weeds to let the flowers grow”, and has said that the company is “nearly done” with its portfolio review. 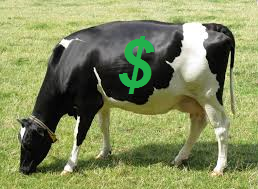 Chief Financial Officer Marc Huët is showing powerpoint slides to investors titled “reducing our dependence on foods”. What, then, is the role and the future of foods at Unilever, a topic which has long engaged the financial press? Is the company “nearly done”? Management at the Purfleet spreads factory has presented Unite with what amounts to an ultimatum to accept devastating reductions in employment, pay and benefits, an increased working week with reduced possibilities for meaningful time off, large redundancies and a reduction of the bargaining unit for remaining employees. Throughout the twelve-week mandatory consultation period which began on October 24, the company’s proposals have been presented on a take-it-or-leave-it basis, with no consideration given to a number of wide-ranging proposals from the union side aimed at meeting management concerns for increased flexibility. The proposed pay cuts are truly disastrous. Losses for a traditional machine operator would start at some GBP 6,000 annually, or 17% of current base pay. Loss of shift premiums and other allowances and performance benefits for some workers would the income loss to over 29% of current negotiated pay levels. Other employees could lose up to nearly GBP 15,000 of their current pay packet or a total loss of 31%, of which 21% would be from base salary. The loss in pension benefits based on the management proposed change would be similarly catastrophic, coming on top of the 2012 changes to the UK pension scheme. With this new burden, employees face an increasingly uncertain future. At the very last minute management agreed to modify its demand for an 8-hour/3 shift scheme, which would have some workers performing up to 6 consecutive 8-hour night shifts and 3 weeks without a meaningful break from work. In its place came a 12-hour scheme proposed by the union, but with no time for full discussion of the implications of the new arrangements or any of the company’s other demands. Abandoning the proposed shift scheme was offered on condition that the union adopt a “neutral” position on the company’s entire proposal, whose pay, terms and conditions had to be accepted as a whole in order to allegedly secure the future of the site. The union has consistently said it recognizes the need for flexibility and is open to negotiation but has run up against a stone wall. At the end of the extended consultation period, the company challenged the union’s “neutrality” and reverted to the original shift proposal! 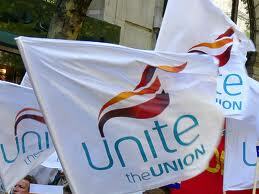 Unite responded that the union reserves the right to fully inform the members of the contents of the proposals and has no choice but to recommend rejection. The company’s autocratic refusal to respond constructively to any of the union’s many proposals has been coupled to the insistence on removing some 30 employees – 14% of the current workforce – from the collectively bargained pay scheme by putting them on individual contracts with performance-based pay. The union proposed to move from the current 39 hours to a 40-hour week, with increased flexibility on banked hours. The union offered a 3-year pay freeze for pre-2009 employees, with some adjustments to lessen pay inequality for the post-2009 employees hired on reduced pay. The company’s response was: “It’s not enough”, despite the cost savings. The company won’t listen to, let alone bargain over, any of the union’s proposals and commitment to negotiate flexibility. Given the poisonous atmosphere created by management’s aggressive attitude, the company will have no difficulty filling its 40 proposed voluntary redundancies. 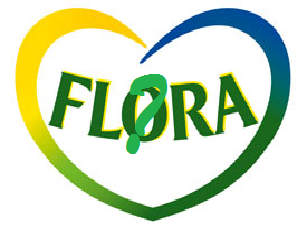 Unilever’s steadfast refusal to give meaningful consideration to the bargaining process, their veiled threats about the future of the site, and the unilateral decision to shrink the bargaining unit by putting a sizeable number of employees on individual contracts constitute a concerted attack on basic trade union rights, rights which Unilever claims to respect. Unilever’s insistence on unilaterally reclassifying jobs to eliminate accumulated skills, seniority and experience has already generated conflict and led to a strike in South Africa. The drastic cuts now unilaterally demanded at Purfleet will not be limited to that site. Unite is planning to ballot for a full recommended rejection and will be preparing an appropriate response if the company continues to reject in practice rights it claims to respect in Unilever policy statements. A recently formed independent union at the Unilever Foods plant in Pakistan has joined the IUF-affiliated Pakistan Food Workers’ Federation (PFWF) further strengthening the Federation’s position as the representative of the vast majority of Unilever workers across the country. The Unilever Foods plant is located outside Lahore and produces instant noodles, chicken cubes, instant soup etc. After years of frustration with a management-created union of just 22 workers at Unilever Foods, workers formed a new union last year called the Shaheen Workers Union Unilever Foods. The union, with 120 members out of a total 178 workers, easily won the certification election and secured sole collective bargaining status. At its membership meeting in December last year the union announced its decision to affiliate to the PFWF and this was formalized in January 2014. Members of the Food and Allied Workers Union (FAWU) at the Unilever Foods Solutions and tea factories in Pietermaritzburg have been on strike since January 17 in disputes over wages and the company’s unilateral job reclassification scheme, which will move current and future workers into a newly-created ‘General Operator’ category with inferior pay and benefits. Negotiations at both Food Solutions and the tea factory deadlocked over wages, with FAWU demanding 10% and 9% increases, respectively, and the company offering no more than 6%. At Unilever Food Solutions, according to FAWU, the company “downgraded the Canister Department and Label Operator positions. There have been two grades in both these sites, AO grade (Autonomous Operator) and UO grade (Universal Operator). Unilever has recently introduced a third layer of grade, the lowest grade called GO (General Operator). The introduction of this grade was discussed and the union objected since the GO’s were used to replace some of the AO grade employees. This then works the same as the Youth Wage Subsidy that we objected to as the federation. A common understanding could not be reached where finally the company forcefully implemented the new grading at R3500 which is on a lower pay scale than the others. Pietermaritzburg is not the first site where Unilever has recently attempted to unilaterally reclassify/downgrade classifications. FAWU is demanding that the company drop the scheme. 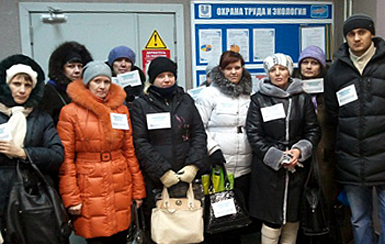 In May 2012 women workers packing ice cream at Unilever’s Inmarko factory in Omsk (Siberia) struck for 3 days demanding union recognition and a return to direct employment. Their jobs had been outsourced to an agency but they continued performing the same jobs at Unilever on inferior terms and conditions. a signed agreement that wages should be raised annually. Management has accepted some form of wage indexing but rejects the other demands, and insists that its meetings with NOVOPROF are only for “information and consultation” – not negotiation. This left the union with no choice but to launch a public campaign. Workers – members and non-members – have signed a union petition in support of wage negotiations and recently reported for work wearing “I support the union’s demands” badges. The union actions have generated considerable attention in the local press and media. Everything is “sustainable” but employment? 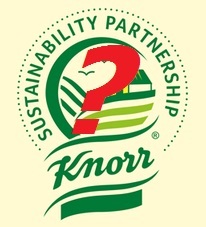 Unilever, who have a Sustainable Living Plan, a Sustainable Agriculture Code and a Sustainable Sourcing policy, among other things, have now launched a Sustainability Partnership logo for certain Knorr products starting in France and Germany. None of these contain a word about sustainable employment. Not really: on closer examination, the logo says nothing about the actual process by which the product was made: “You’ll have the logo and not the logo in the same country depending on whether the key ingredients are sustainably sourced or not”, de Saint Affrique told the interviewer. Another example: the Knorr “Sustainability Partnership” hasn’t yet come to Greece, but the company’s operations in Gastouni, Unilever tells us, are “inspired by the Knorr vision of sustainable farming”. The company says it is working with farmers to reduce water consumption and promote organic mulching to replace plastic, but, 56% of the factory workers who make the consumer product are employed on precarious contracts with no job security This hardly qualifies as sustainable employment – is the labour behind the product not a “key ingredient”. As elsewhere in Europe, Greece relies on exploited and abused migrants for the bulk of its agricultural work. Earlier this year, the topic briefly hit the news when a Greek strawberry farmer opened fire on 200 migrant strawberry pickers who demanded their wages after working for six months without pay. In agriculture, no certification scheme based on codes or audits can capture the reality of the situation. Child labour, among other abuses, is endemic throughout agriculture, a symptom of the poverty and degradation to which those who labour to feed the world are almost universally subjected. The IUF has encountered child labour on fairtrade certified tea plantations. The Rainforest Alliance, a key pillar of Unilever’s sustainable sourcing program, has served as a cover for union-busting on plantations (link). What about the dwindling number of those who still work for Unilever, many of them on precarious agency or temporary contracts? Is their situation “sustainable”? Some 70,000 jobs have been eliminated in Europe alone over the past decade. Harald Wiedenhofer, general secretary of the IUF’s European regional organization EFFAT, commented on Unilever’s latest results that the company’s sustainable living program had proved sustainable for profits but not for employment. Unilever corporate management has shown itself open to engagement with the IUF and its affiliates on reducing the number of precarious jobs, and there has been progress. However, precarious employment remains rampant within the Unilever system, and sustainable employment has yet to find a mention, let alone a defined function in the company’s varied sustainability schemes. Until that happens, unions have a fundamental obligation to highlight the absence of this key ingredient – and to fight for its inclusion. Nothing is sustainable without sustainable employment and rights at work. FNV Bondgenoten members who will be outsourced to Sodexo  on May 1 ended their strike on April 9 with a spirited demo at Unilever headquarters while a new international support action by South African IUF members was taking place in at Unilever Food Services Pietermaritzburg. After an unprecedented 6 weeks of industrial action in the Netherlands Unilever finally agreed to negotiations and the strikers approved the settlement on April 12. On April 9 the strikers gathered at Unilever headquarters in Rotterdam dressed in wigs and masks and pushing rollators. When Unilever’s CFO agreed to meet with the strikers they presented him with an abacus, the traditional Chinese calculating device, to compute their pension losses. The long denied negotiations then got underway between Unilever and the union.